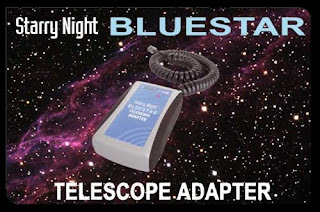 Completed my testing of the Starry Night Bluestar wireless adapter from the Gaherty collection. It was good to get some experience with it, even though a discontinued product. I also wanted to be able to report that it was functional. The key benefit obviously is to eliminate one wire going to the telescope-mount and in that respect it worked, sorta, mostly. I had random and periodic connection errors. I tested the small device with an ASUS Windows XP netbook computer (using SkyTools) and with a ASUS Android tablet (using SkySafari). In turn the Bluetooth transceiver was connected to a Celestron CGEM NexStar hand controller. It both cases I was able to connect to the telescope and slew to targets while untethered. Initially, as I learned the device, I did not understand how to connect. For the computer, I had to install the downloaded drivers before starting. I learned that one needs to power the device (with two AA batteries), turn it on, note the blinking red LED, optionally reset the device (with a paperclip in the small back port), pair it with the computer or tablet, on Windows start the slave serial port function, note the LED extinguishing, note the assigned port (a serial COM in Windows), and then carry on. The experience in SkyTools 3 Pro was nominal. Everything worked as expected in turns of slewing to targets, manual moving, and telescope feedback. When the Bluestar or the Bluetooth software on Windows hiccuped, SkyTools performed badly. One time I had to kill the ST3P task to recover. But I think that's ultimately an issue with the planner software struggling with a suddenly absent connection. Still, overall, it was good and I could see the advantage in terms of mobility. At least being able to roam as far as the Bluetooth envelope would allow... I was never more than a metre or so away. Very briefly I tried using NexRemote with the Bluestar. I was not able to get a connection after two quick tries and did not pursue the matter further. I learned in researching and reading that the Bluestar doubles as a USB-serial adapter. That's an interesting side benefit given the curious hardware port issues with telescopes (hanging onto the old trusty serial protocol) and modern computers (with USB ports on every edge) and tablets (with one tiny USB port). Using the option defeats the cordless feature but that might be the best option. Stumbled across Geoff's review from March 2006. Not sure why the Bluestar is discontinued. Was it a matter of random sporadic issues like what I experienced? Issues with Bluetooth technology? Was it old tech, making way for new? There seems to be the SkyFi III option available currently signalling that Simulation Curriculum is still in the hardware game. It is not a Bluetooth device. Oh. Learned there's a distinct product, SkyBT, available as well... New, smaller, runs on two AAA, 9-pin serial port, a class 1 Bluetooth device, 100 metre range.